If you remember a while back, like two whole years ago (!! 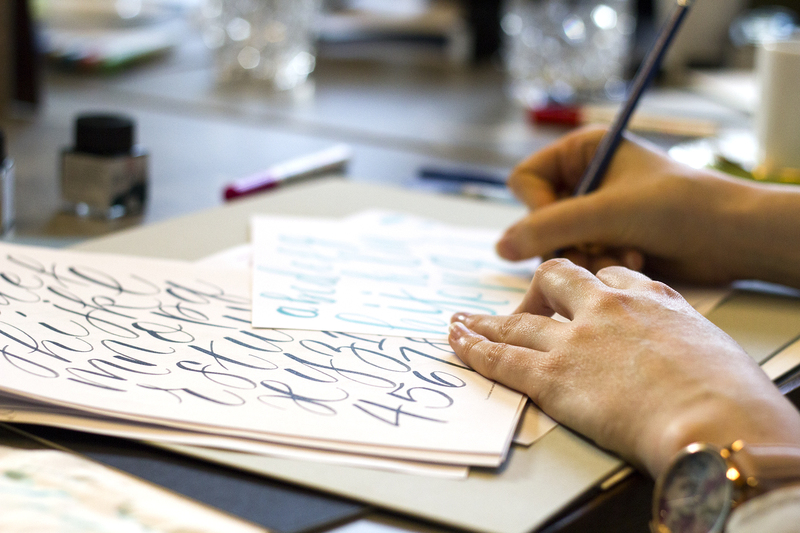 ), I took an introduction to modern calligraphy workshop with the lovely Joyce (aka Artsynibs). 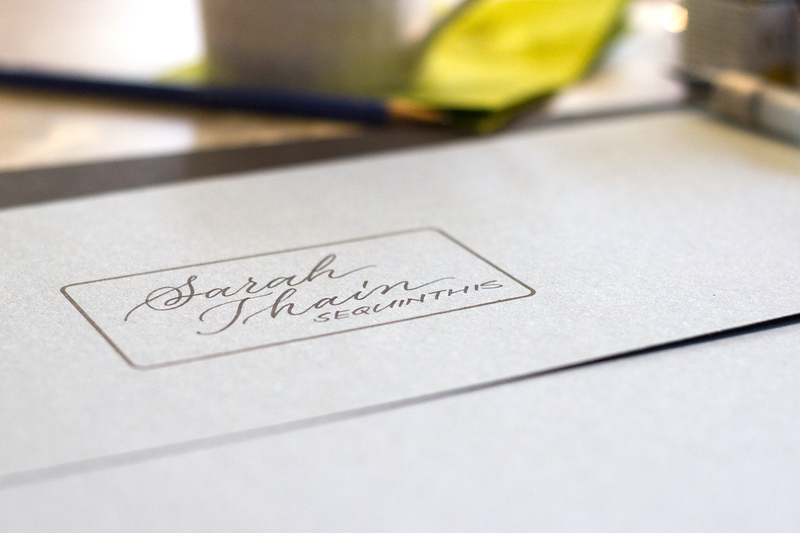 A whole afternoon of practising letterforms, remembering to breathe, getting the perfect posture and finally creating something that actually looked half-decent. Even if I did smudge my quote… a lot. 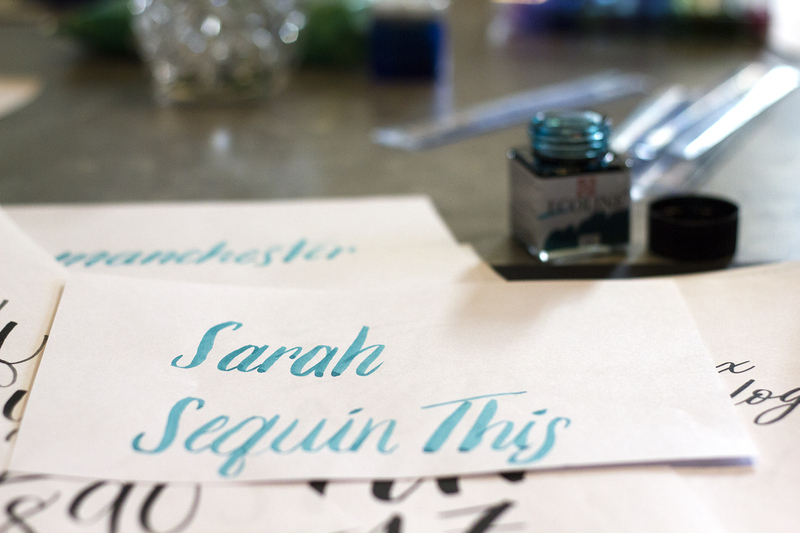 As fun as it was to try something new, I don’t think calligraphy quite suited my style and my clumsy hands! 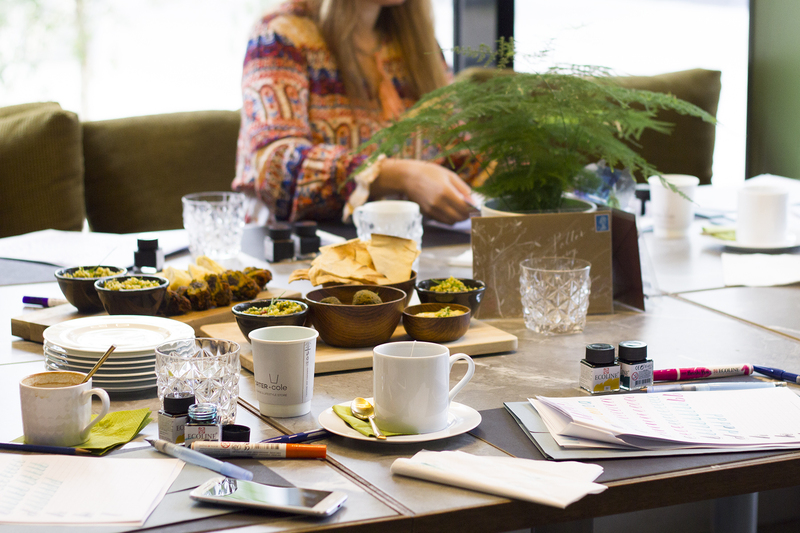 So I was really pleased when I found out that Joyce was now running brush lettering workshops too, which are a little more informal than calligraphy. It seemed much more appealing to me and the smudge-risk was much lower. 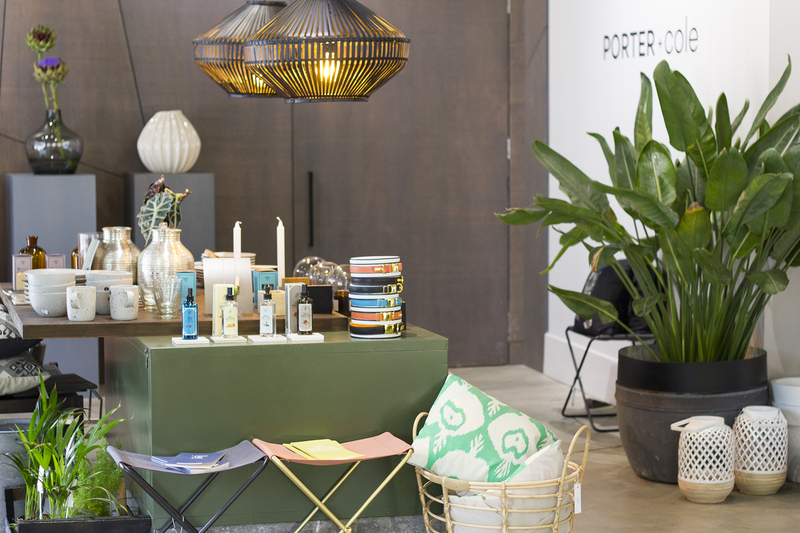 When Joyce asked me to join the workshop in Porter + Cole, a new coffee shop/lifestyle store in the Northern Quarter, I couldn’t really say “yes” quickly enough. I knew I was in for a relaxing afternoon and I would hopefully come away with a new skill too! With an Artsynibs workshop, there are a few things that stick with you even two years down the line. A few little things to do and remember before you dive straight into practising your letters or crafting a quote. 1. Posture. I know, most of us sit at desks all day so the hunch is very real. But for brush lettering & calligraphy, it’s really important to have good posture and not slump over your paper. You’ll probably find yourself hunching up closer and closer to the page, but it only makes things more difficult. 2. Warmup. You’ll feel like you’re in primary school again. You’ve got to loosen up those hands, wrists and arms with some crazy circle and line drawing before you start. Trust me, it makes your first letters much less embarrassing! 3. Breathe. I know what you’re thinking, “I won’t just forget to breathe…”. Oh but you will. 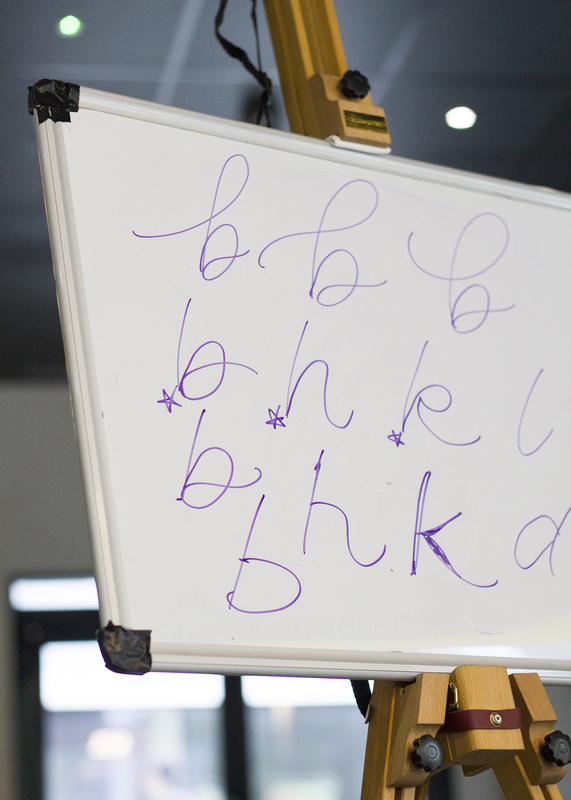 You’ll be concentrating so hard on those letters that you’ll hold your breath and tense up. Just chill and take a few deep breaths. Your page and your body will thank you. Once you’ve nailed the basics, it’s the same as most skills: practice makes perfect. 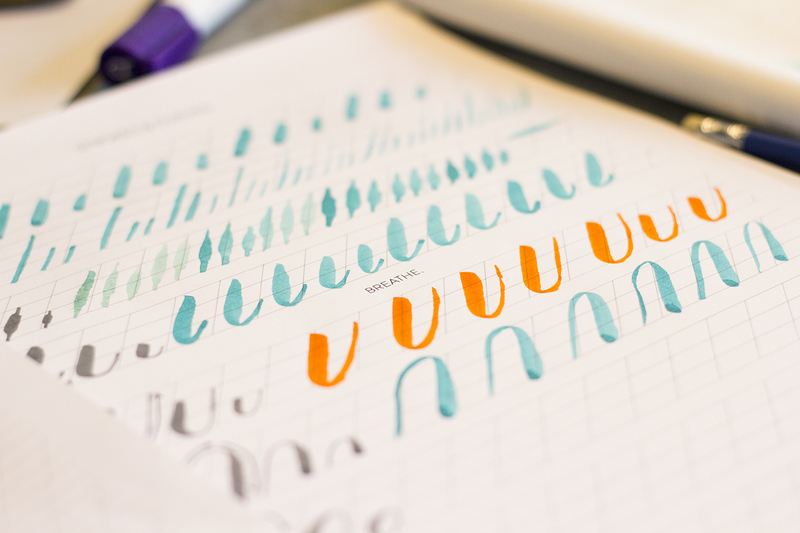 We all have different handwriting styles, so Joyce encourages you to find the letterforms that feel most natural to you. 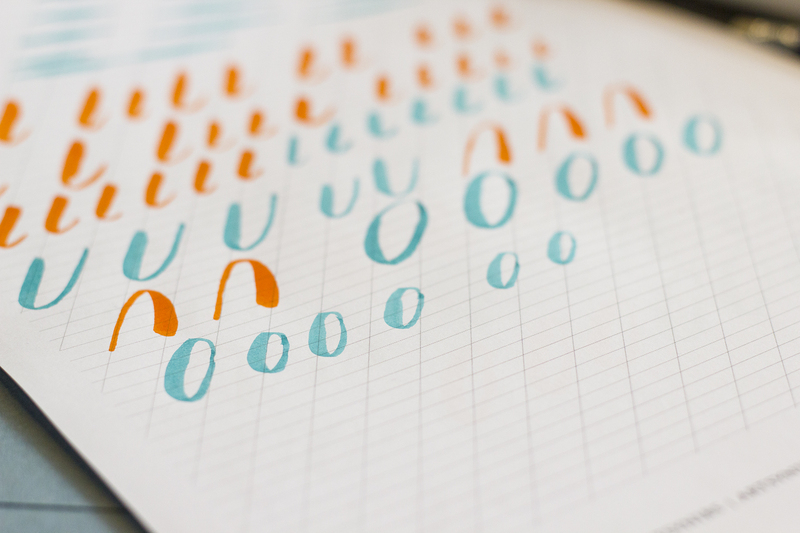 Some people prefer simple & clean letterforms, others prefer bold & flourished letterforms. We got to work and practised our ABCs using different styles, but also trying out the different brush pens that Joyce had laid out for us. The first looked like a pretty ordinary fineliner type pen, but actually had a surprising amount of flexibility and was a dream to write with. The second was an Ecoline brush pen, which gives a bit more of a watercolour ink effect but with the ease of a pen. 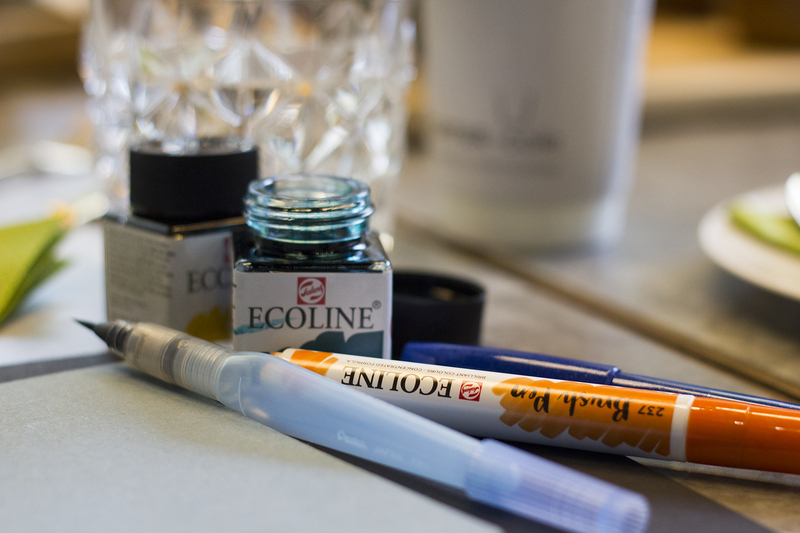 The final tool was a nylon-tipped brush pen, which you dip into liquid watercolour ink. It’s a little trickier to handle, but definitely ended up being my tool of choice! I can’t really talk about an Artsynibs workshop without talking about the vibes and the atmosphere. I was super nervous about my first workshop two years ago. I’m a bit of a socially awkward gal at times, but as soon as I settled into my spot for the afternoon, Joyce made me feel at ease. She lays out the cutest personalised packs for everyone, making sure you have everything you need from the get-go. 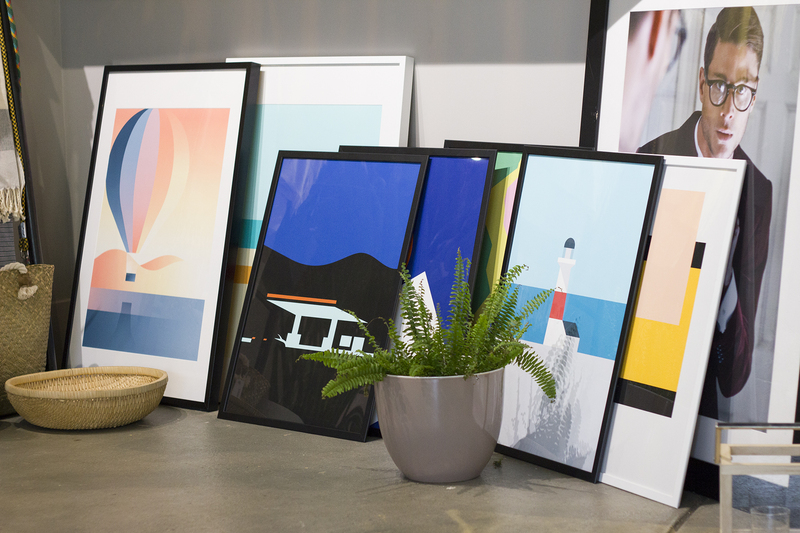 The group is always full of like-minded people from different backgrounds, so you’ll never feel like the odd one out. 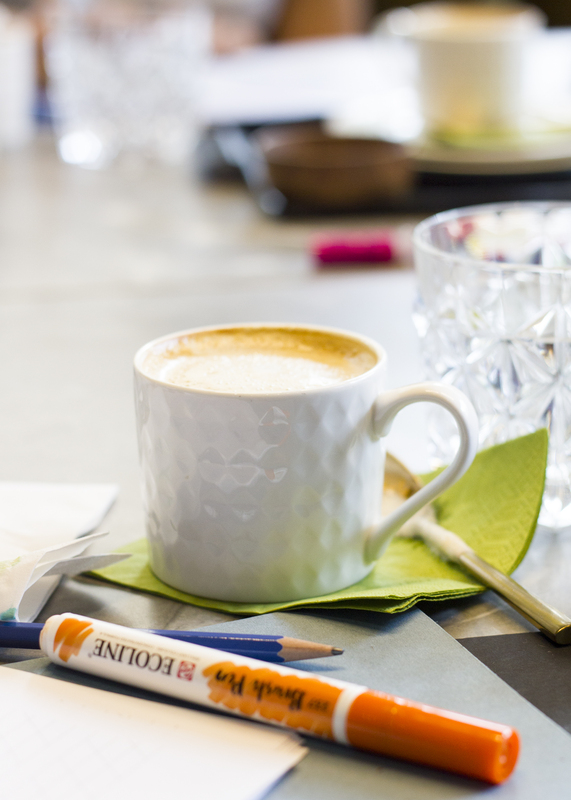 Our workshop was also hosted in the beautiful Porter + Cole so we had the best coffee, tea & food on offer during the afternoon, which was lovely. 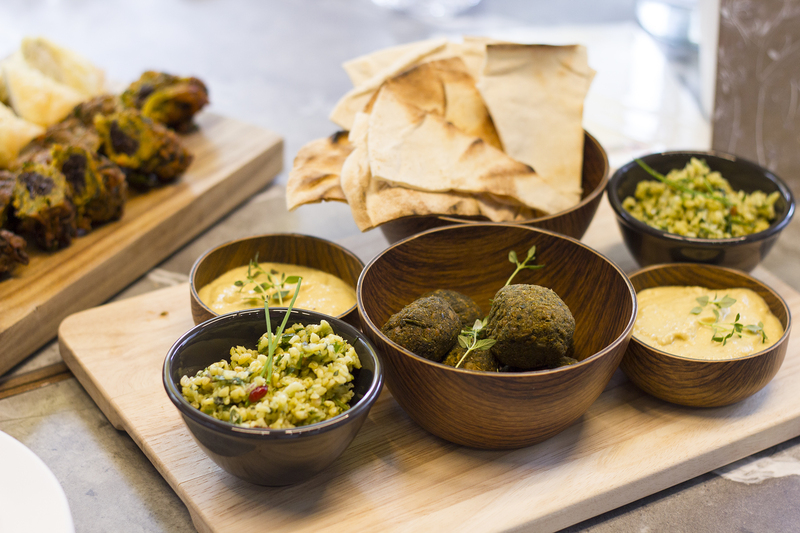 All that writing makes you surprisingly peckish! After all that practice, I became a pro. Ok, not 100% true, but I do feel like I progressed a lot in the 3 hour workshop. It felt like it went so fast and for me, it was definitely better suited to my style than calligraphy. 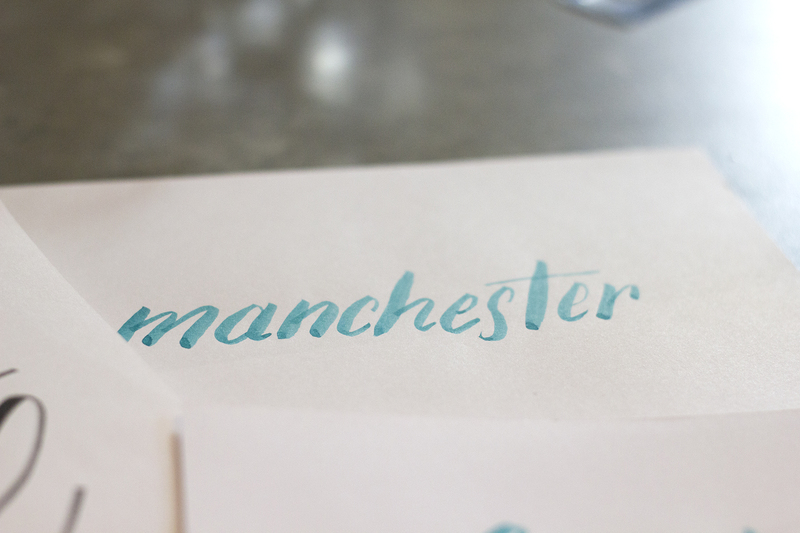 I had a go at writing my own name, blog name and the word ‘Manchester’. Sounds a little like I’ve been back to school and it kind of was, but 100 times more interesting and relaxing. The best part of the workshop is that you get to take your tools home with you! So I’ve got lots of practice to cram in before I start throwing out beautiful brush lettering quotes on my Instagram. 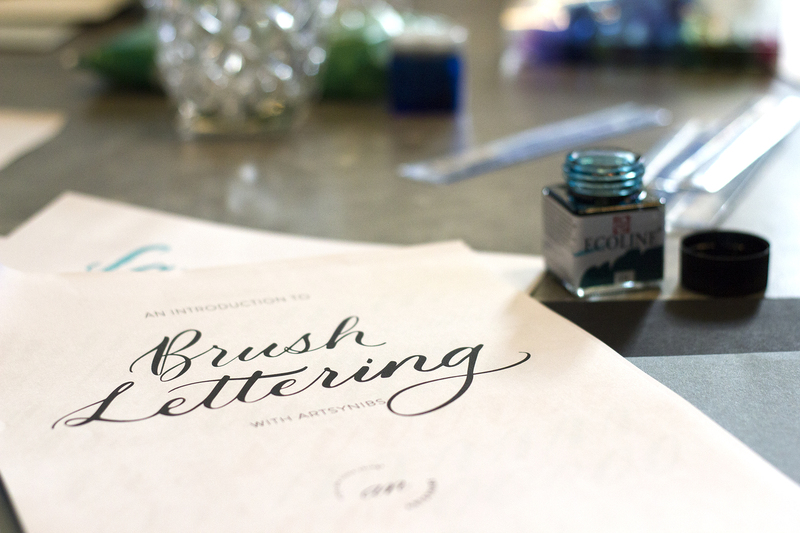 I’m actually really looking forward to some chilled Sunday afternoons practising my brush lettering! 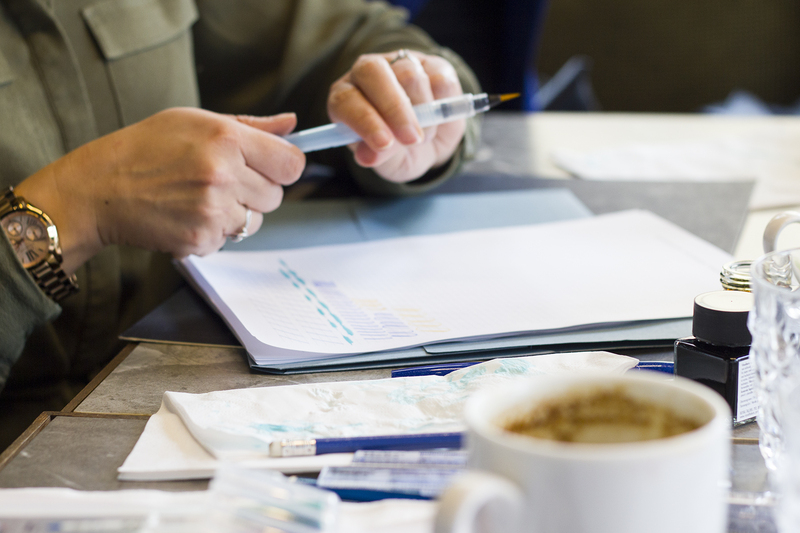 If you’d like to book your own calligraphy or brush lettering workshop, or even as a gift for someone else, check out the Artsynibs website here. Disclosure: I was invited to attend free-of-charge as a guest to the workshop, but all thoughts & opinions are my very own.